Failed to update your device to iOS 10.3/10.3.2/10.3.3? 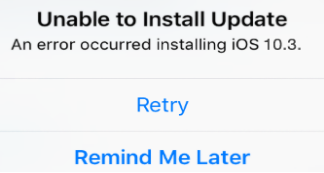 Then read this post, which provides several methods to help you tackle this “An error occurred installing iOS 10.3/10.3.2/10.3.3” issue. PhoneRescue is a powerful date recovery software for iOS 10/iOS 10.1/iOS 10.2/iOS 10.3.2. Now just get PhoneRescue and let it help you to get back lost date and repair dead iOS device. A couple days ago, Apple just officially launched the new iOS 10.3.3. It’s considered as a minor point release update containing bug fixes and security improvements for previous iOS 10.3/10.3.2, which added some amazing new features like the Apple File System, Find My AirPods, Apple ID Profile Page. As usual, being an Apple fan, you must be quite eager to give iOS 10.3/10.3.2/10.3.3 a try. However, many users encountered the unable to install update problem when they are trying to update their device to the new iOS 10.3, and no matter what they do it just keeps telling them “An error occurred installing iOS 10.3”. Although we can’t explain why is this error happening, it’s one of the most common issues as we know, appeared when we want to download and install the newest iOS version. And fortunately, there are still some solutions for us to tackle this problem. So keep reading and you’ll find the answer. Method 1. Reset Network Settings. Sometimes the network environment would lead to the failed installation, so you can rule out this factor first by checking and resetting your network settings: Go to Settings > General > Reset > Tap on Reset Network Settings. Method 2. Force a Restart on Your Device. Sometimes, forcing a restart on your device just might do the job. So if your update fails, you can try this simple method. And for some users, it seems to work: Press and hold both the power button and the Home buttons and continue holding until the Apple logo appears. Method 3. Close Settings App and Wait for Some Time. If you have retried but nothing works, maybe you can try refreshing your Settings app or just wait for some time rather than rush to the upgrade. To close the Settings App you should: Double tap your Home button > Swipe up on the Settings app until it slides out of view. Next you can try to install the update again: Tap Settings and go to General >Software Update. Method 4. Turn Off Wi-Fi and Switch to the Cellular Data. The same problem occurred when users want to upgrade to iOS10.3 beta 1. However, people found out that if they download the beta profile via Wi-Fi, then switch to the cellular data when the Install Now button appears, it would update successfully. So maybe the same method can be also applied to this problem, just don't hesitate to give it a try. Method 5. Update Device with iTunes. Connect your device to your computer and launch iTunes > Select your device and click Summary > Check for Update > Click Download and Update, enter your passcode if asked. 1. The methods that we mentioned above can also be applied to an error occurred installing iOS 10.3.3 issue. 2. If you got the “No Update Found” message when you try to update via iTunes, there is a one step you bypassed, which is removing the unpacked iOS update from your device first: Tap on Settings > General > Storage & iCloud Usage > Tap on Manage Storage > Scroll down to check if you have the iOS 10.3/10.3.2/10.3.3 update list > Delete it if you have. That’s all for how to fix an error occurred installing iOS 10.3 issue, hope these basic tips we list above can help you out of this problem. And if you still have questions you can contact Apple Support Team or just leave your comments below.